Chinese influenced Greek meat sticks. Different… Yes! Delicious… Yes!! 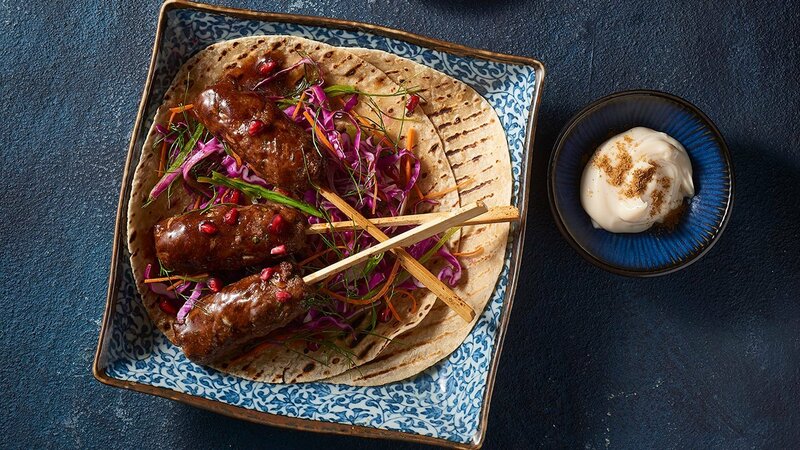 Using honey soy to flavour the traditional lamb kofta excites and inspires your customers. In a large mixing bowl mix all ingredients until combines. Take a large gastronome tray and line with baking paper. Gather 60x 15cm Bamboo skewers. Form mix into desired size and shape. Lay out on lined tray ready to seal and bake. Seal in a lightly oiled pan and then onto tray and into oven until cooked through. To serve - lightly grill tortillas. Take a large mixing bowl and mix all ingredients until combined. Set aside until ready to use.